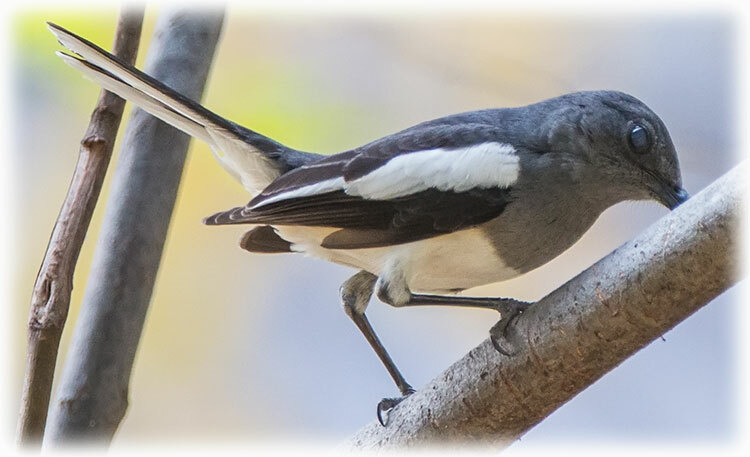 Occurring across most of the Indian subcontinent and parts of Southeast Asia, they are common birds in urban gardens as well as forests. They are particularly well known for their songs and were once popular as cagebirds. 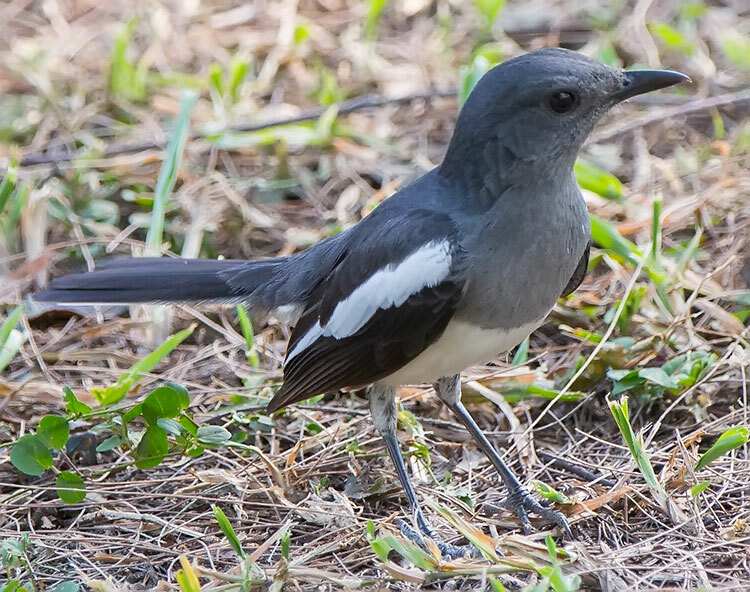 The oriental Magpie-robin is the national bird of Bangladesh. 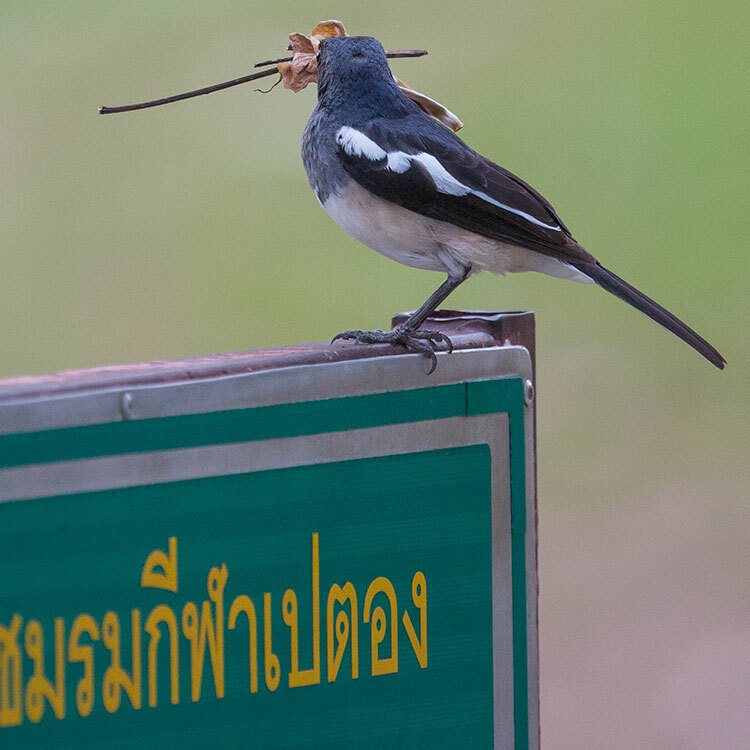 This Magpie-robin is a resident breeder in tropical southern Asia from Bangladesh, interior India, Sri Lanka and eastern Pakistan east to Indonesia, Thailand, south China, Malaysia, and Singapore. 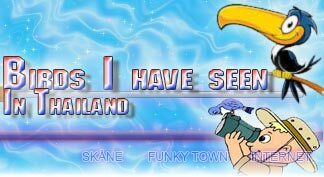 They have been introduced to Australia. 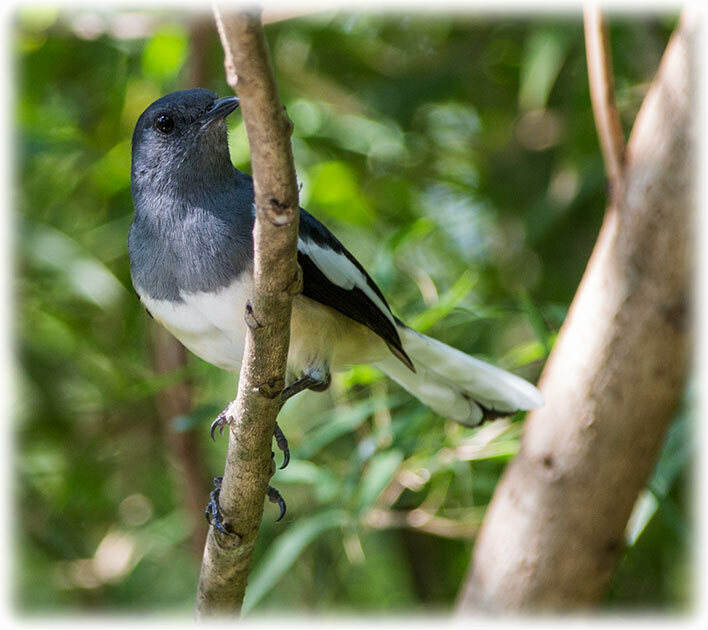 The oriental Magpie-robin is found in open woodland and cultivated areas often close to human habitations. This species is 19 centimetres long, including the long tail, which is usually held cocked upright. It is similar in shape to the smaller European Robin , but is longer-tailed. The male has black upperparts, head and throat apart from a white shoulder patch. The underparts and the sides of the long tail are white. 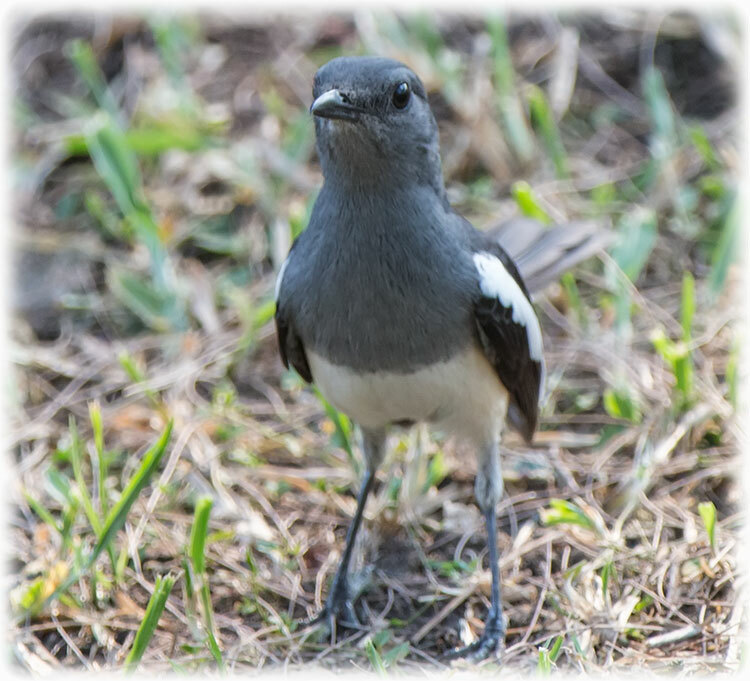 Females are greyish black above and greyish white. Young birds have scaly brown upperparts and head. It is the national bird of Bangladesh. The nominate race is found on the Indian subcontinent and the females of this race are the palest. The females of the Andamans race andamanensis are darker, heavier-billed and shorter-tailed. The Sri Lankan race ceylonensis (formerly included the Peninsular Indian populations south of the Kaveri River) and southern nominate individuals have the females nearly identical to the males in shade. The eastern populations (Bhutan and Bangladesh) have more black on the tail and were formerly named erimelas. 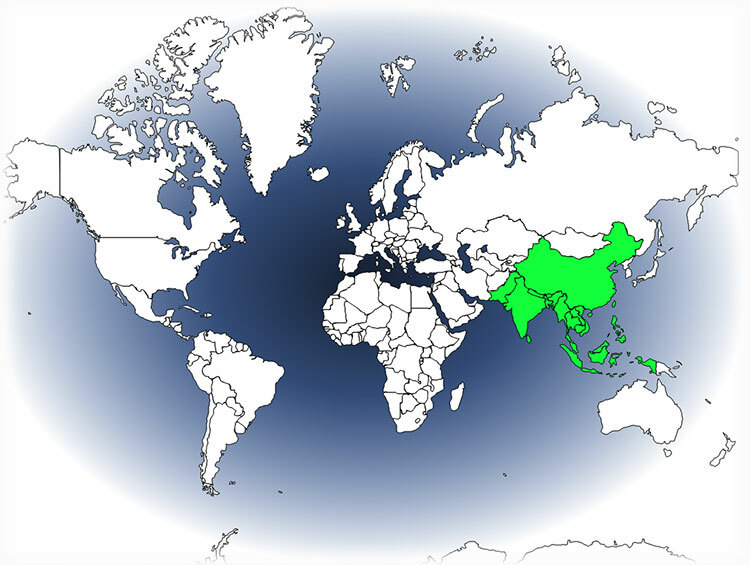 The populations in Burma and further south are named as race musicus. A number of other races have been named across the range including prosthopellus (Hong Kong), nesiotes, zacnecus, nesiarchus, masculus, pagiensis, javensis, problematicus, amoenus, adamsi, pluto, deuteronymus and mindanensis. 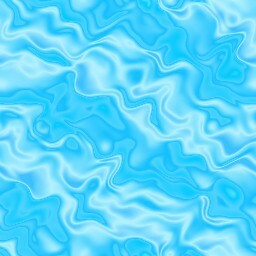 However many of these are not well marked and the status of some are disputed. 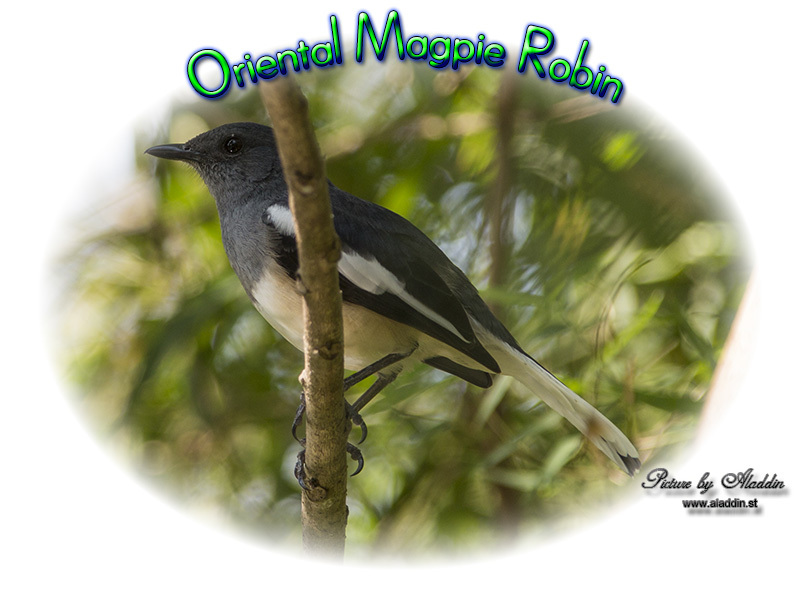 Some like mindanensis have been now been recognized usually as full species (Philippine Magpie-robin). There is more geographic variation in the plumage of females than in that of the males. 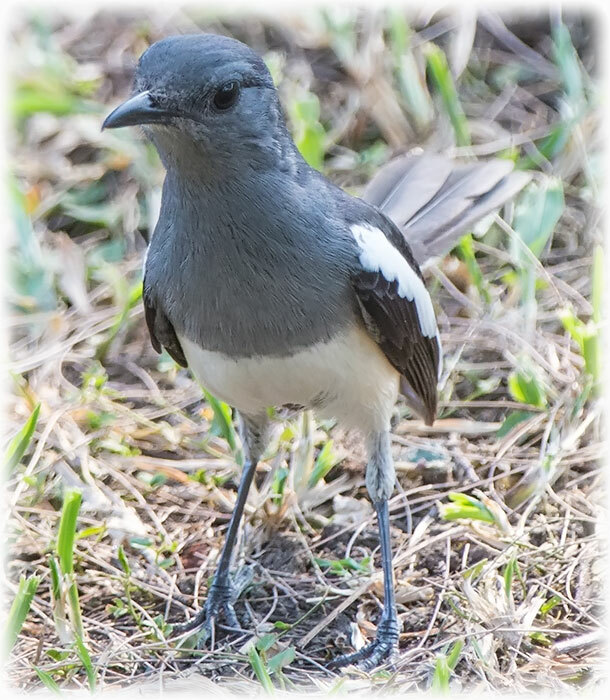 It is mostly seen close to the ground, hopping along branches or foraging in leaf-litter on the ground with a cocked tail. 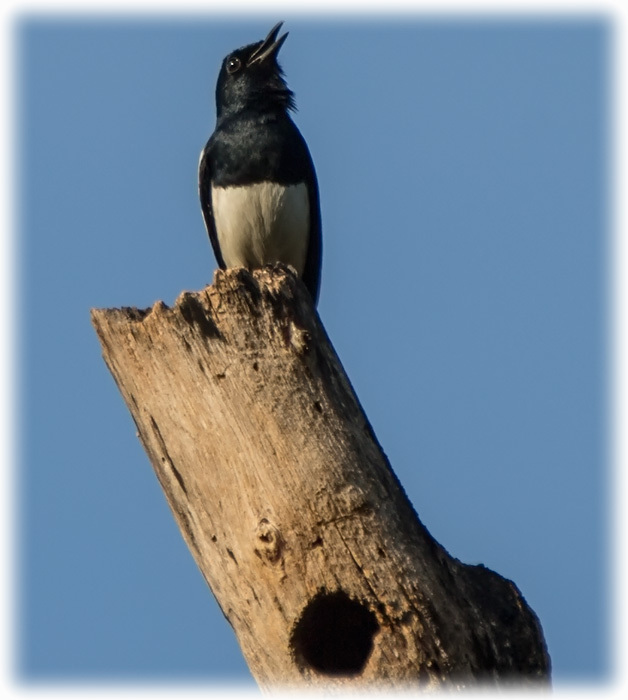 Males sing loudly from the top of trees or other high perches during the breeding season. Early morning bird watching at Tiger Tops Tharu Lodge before going for tiger safari. The bird was sitting in a tree outside my room, maybe 5 or 6 meters up. The Indian name of dhyal or dhayal has led to many confusions. 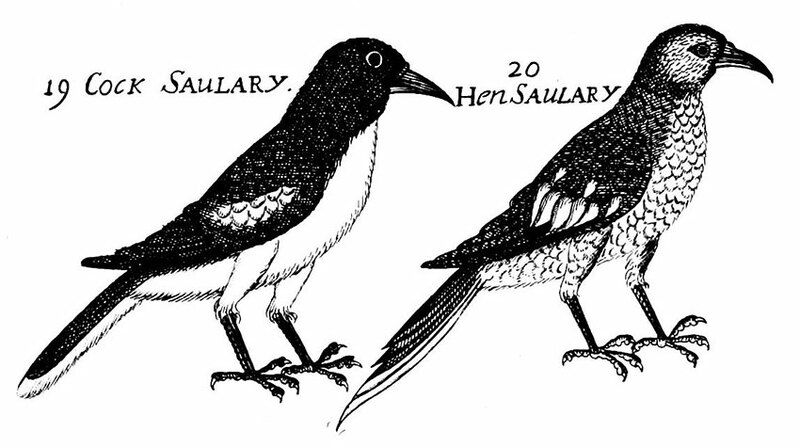 It was first used by Eleazar Albin ("dialbird") in 1737 (Suppl. N. H. Birds, i. p. 17, pls. xvii. xviii. ), and Levaillant (Ois. d'Afr. iii. p. 50) thought it referred to a sun dial and he called it Cadran. Thomas C. Jerdon wrote (B. India, ii. p. 1l6) that Linnaeus, thinking it had some connection with a sun-dial, called it solaris, by lapsus pennae, saularis. This was however identified by Edward Blyth as an incorrect interpretation and that it was a Latinization of the Hindi word saulary which means a "hundred songs". 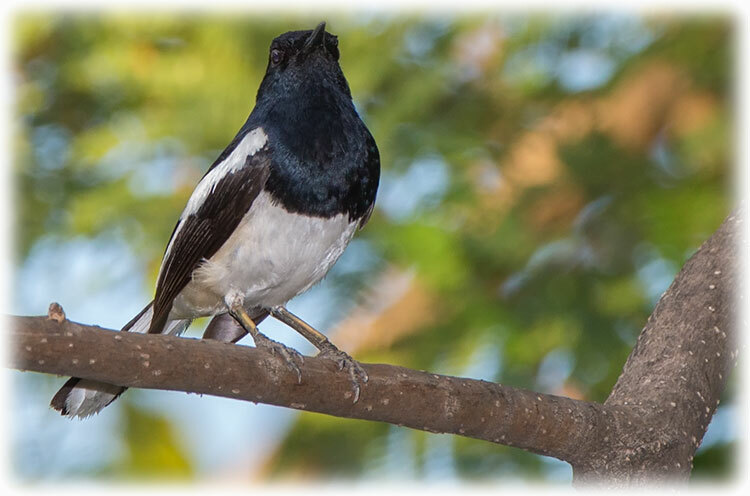 A male bird was sent with this Hindi name from Madras by surgeon Edward Buckley to James Petiver, who first described the species (Ray, Synops. Meth. Avium, p. 197). 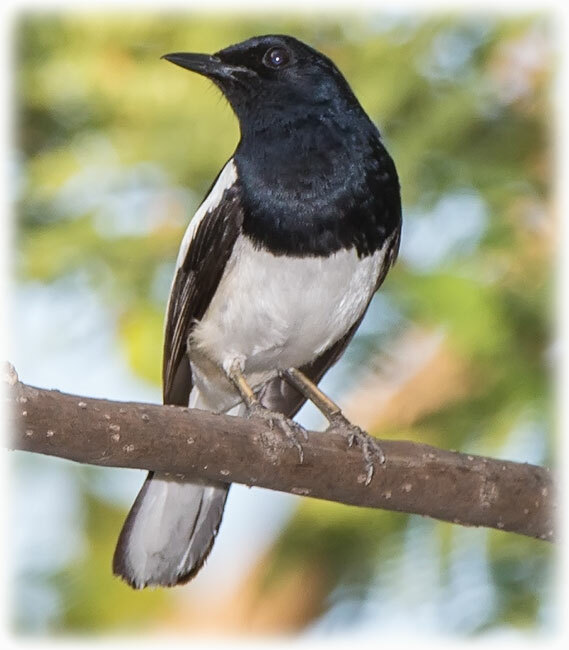 Magpie Robins breed mainly from March to July in India and January to June in south-east Asia. 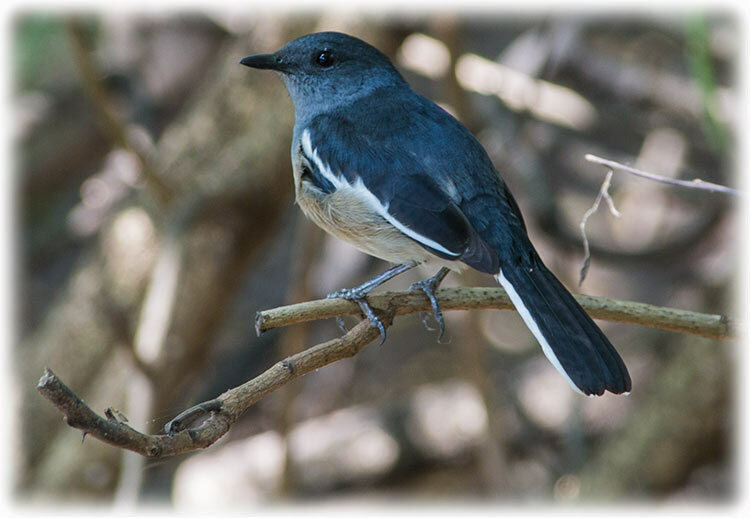 Males sing from high perches during courtship. The display of the male involves puffing up the feathers, raising the bill, fanning the tail and strutting. 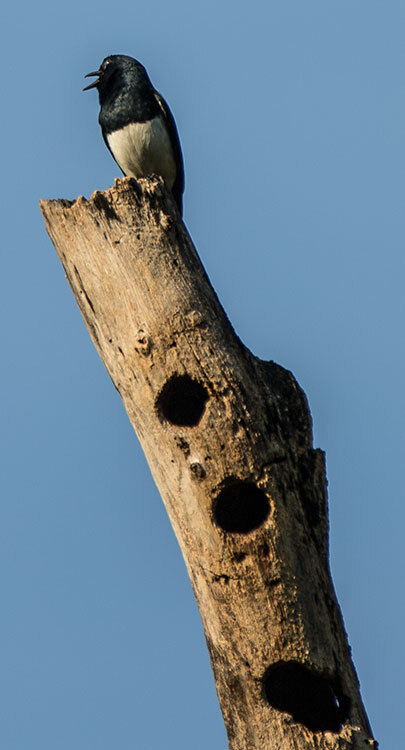 They nest in tree hollows or niches in walls or building, often adopting nest boxes. They line the cavity with grass. The female is involved in most of the nest building, which happens about a week before the eggs are laid. 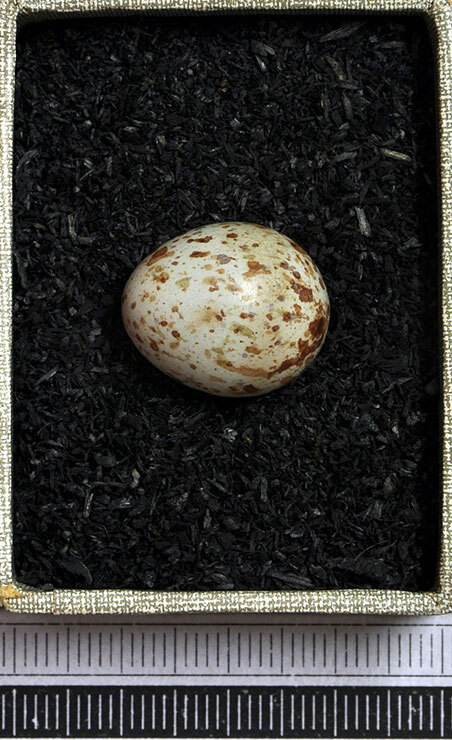 Four or five eggs are laid at intervals of 24 hours and these are oval and usually pale blue green with brownish speckles that match the color of hay. The eggs are incubated by the female alone for 8 to 14 days. The nests are said to have a characteristic odour. Females spend more effort on feeding the young than males. Males are quite aggressive in the breeding season and will defend their territory and respond to the singing of intruders and even their reflections. Recordings of this species are currently restricted. Why are recordings of certain species restricted? Some species are under extreme pressure due to trapping or harassment. The open availability of high-quality recordings of these species can make the problems even worse. For this reason, streaming and downloading of these recordings is disabled. Recordists are still free to share them on xeno-canto, but they will have to approve access to these recordings. We do not take this action lightly, and we wish it were not necessary, but we have been convinced that the negative impacts of offering easy access to these recordings outweigh the benefits. If you would like access to these recordings, you may contact the recordist directly. 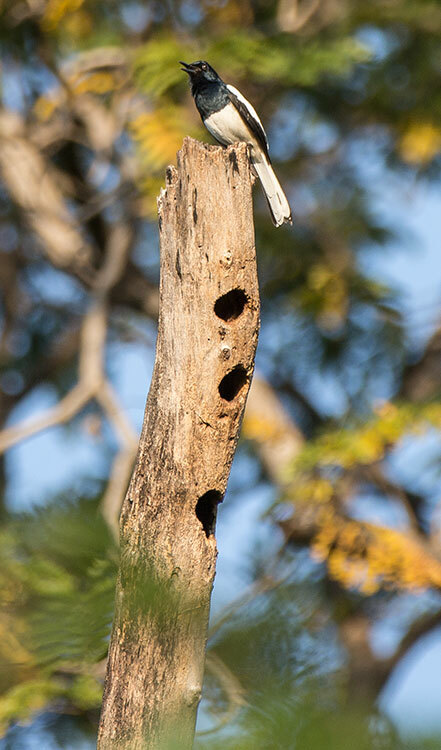 Males spend more time on nest defense. Studies of the bird song show dialects with neighbours varying in their songs. The calls of many other species may be imitated as part of their song. This may indicate that birds disperse and are not philopatric. 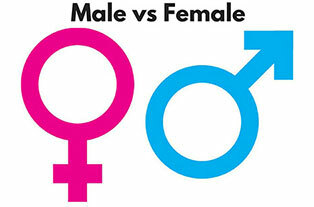 Females may sing briefly in the presence of a male. Apart from their song, they use a range of calls including territorial calls, emergence and roosting calls, threat calls, submissive calls, begging calls and distress calls. The typical mobbing calls is a harsh hissing krshhh. 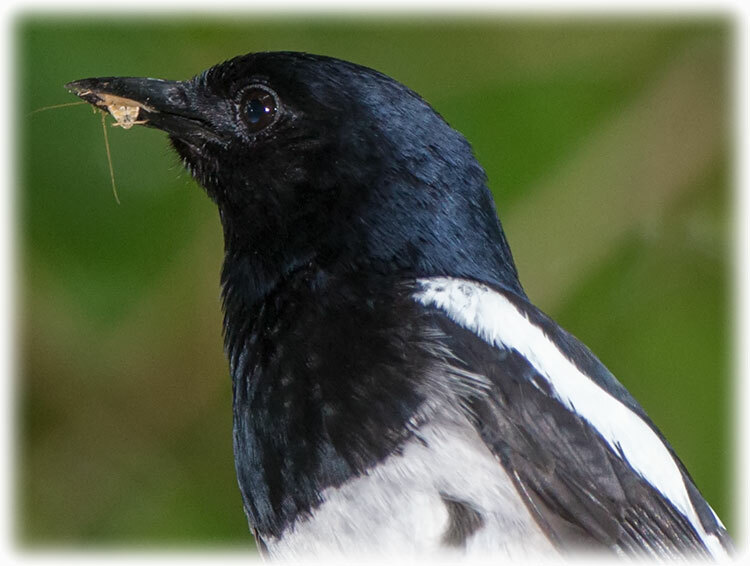 The diet of Magpie Robins includes mainly insects and other invertebrates. Although mainly insectivorous, they are known to occasionally take flower nectar, geckos, leeches, centipedes and even fish. verb (of a group of birds or mammals) surround and attack (a predator or other source of threat) in order to drive it off. This species is considered as one of "little concern" globally but in some areas the species is on the decline. In Singapore and Hong Kong (Malay names Murai Kampung/cacing) they were common in the 1920s, but declined in the 1970s, presumably due to competition from introduced common mynas, Poaching for the pet bird trade and habitat changes have also affected them and they are locally protected by law. 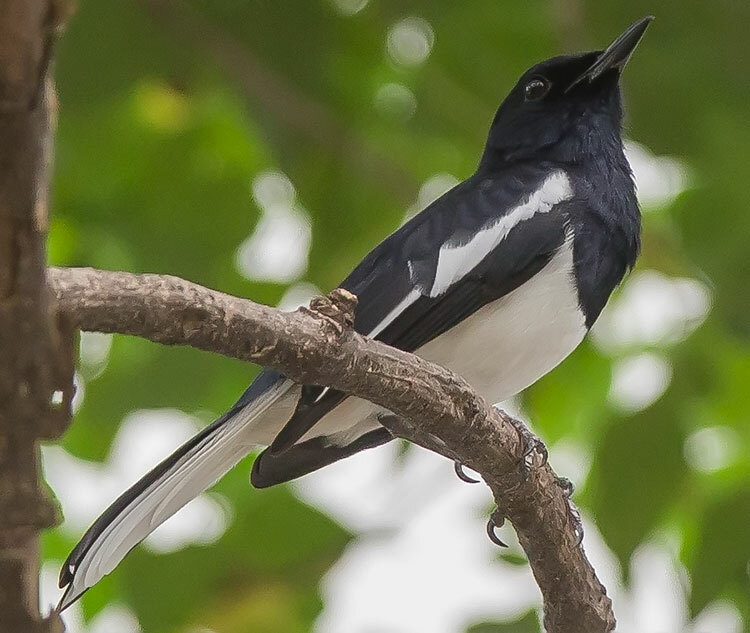 The Magpie Robin is the national bird of Bangladesh, where it is common and known as the doyel or doel (Bengali: দোয়েল). 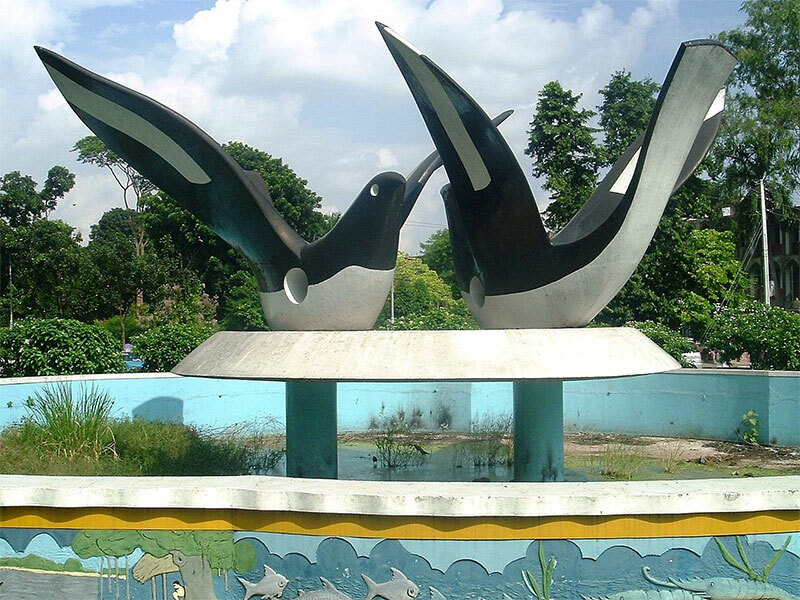 It is a widely used symbol in Bangladesh, appearing on currency notes, and a landmark in the city of Dhaka is named as the Doyel Chattar (meaning: Doyel Square). In Sri Lanka this bird is called Polkichcha.